In a large sauce pan, over medium heat, melt butter. Add in marshmallows and keep stirring constantly until completely melted into a marshmallow crème sauce. Remove from heat. 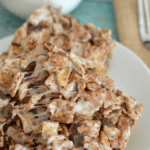 In a large bowl, combine marshmallow crème sauce and Golden Grahams until they are completely coated. Once completely coated, stir in frozen chocolate chips. (Freezing the chocolate chips will help them keep their shape). Grease a 9x13 pan and press S'mores down evenly with parchment paper.